I decided to treat my boys to fresh strawberry muffins this morning. This is one of the best things about not working outside of the house. I used to leave the house at 6:15 when the house was dark and my guys were still sleeping. Now, I get up at 6:30, wake them up, usher them into showers, make them breakfast and make their lunch (What, make it the night before? Pfffft!) 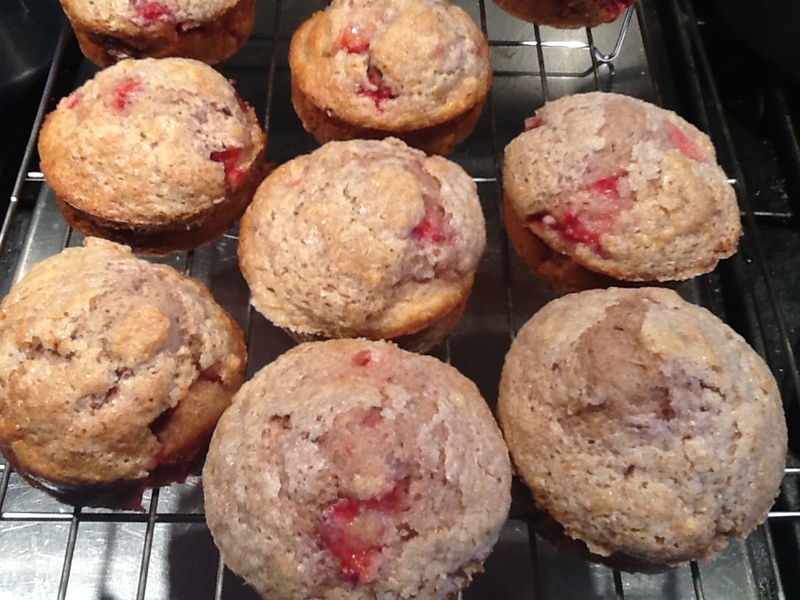 and, when they are lucky, make them something like strawberry muffins. Warm, direct from the oven good! For me, this is the best part of being home. Caring for my family, making them healthy food and being in the moment. This is my kind of morning rush hour! This entry was posted in Uncategorized and tagged caring for family, morning rush hour, Strawberry muffins. Bookmark the permalink. Indeed! They were a Martha Stewart recipe… mixed and baked within 20 minutes!